The candidate members form (candidate process) will be open between from April 28, 2019 (22:00 CET) until May 11, 2019 (22:00 CET). Candidates will have to provide a bio, a motivational letter and 'plan' on how they will achieve their proposals. 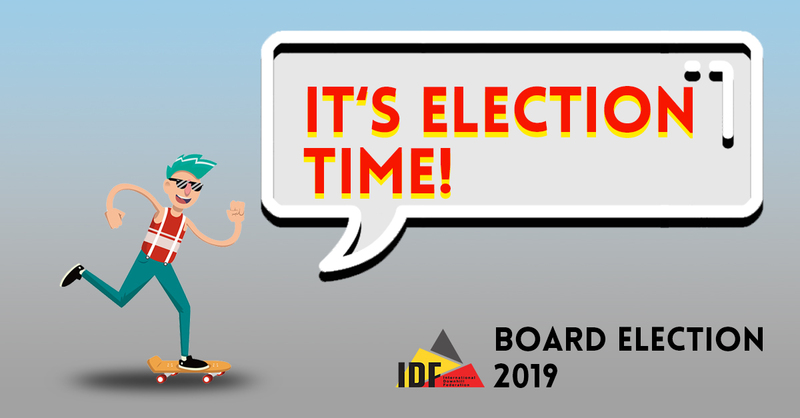 Board candidates will be presented to IDF members on May 13, 2019 on the IDF website. All paying IDF members can vote for candidates from May 17, 2019 @ 22.00 CET to May 18, 2019 @ 22.00 CET. The AGM will be held online, on May 19, 2019 @ 22:00 CET. 7 board members will be announced at the end of the AGM. The executive board members (President, General Secretary, Treasurer) will be designated at the next IDF Board Meeting, to be decided by the board members, within a period of 21 days following the AGM. The International Downhill Federation (IDF) is built on a group of 7 ‘board members’ who volunteer their time on a daily basis to help organize the world cup circuit and all of the back end work that it entails. Every two years an election is undertaken to determine the group of board members for the two years to come. Between May 17 to 18, all active IDF members will be able to vote to elect the next IDF Board Members for the following term. In addition to the ability to vote, paying IDF members who have been active for a year may also run for the board and volunteer their time to help run the organization. These positions are purely on a volunteer basis and to run for the board you must be willing to spend 5-10 hours a week. Experience has shown that members who are not currently racing have more time to spend towards the IDF through helping at events and between events. Being part of the IDF board is an exciting opportunity to be involved in the international community for downhill racing. Through volunteering you will undoubtedly learn new skills, work with a global team that supports each other, travel to events, and help shape the future of a growing sport. If you plan to run for the election, we strongly recommend that you sit in on a meeting and do some partial volunteering to get an understanding of what running for the board would entail. Contact us via our volunteer form.